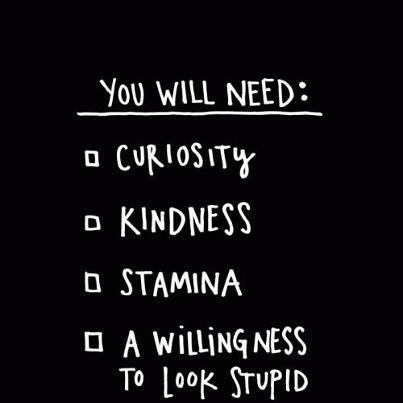 Are you willing to look stupid? The only way we improve at something is to push the boundaries of the possible. We need to build new “connections” in our brain; which means screwing up after reaching for a new skill…and often looking stupid in the process. When did we become scared of looking silly? When we were babies, we tried to walk over and over. We looked silly. We fell down a lot. And we got right back up and went at it again without remorse. In the “Little Book of Talent“, Daniel Coyle writes about Wayne Gretzky skating drills during practice. During the drills, teammates would watch Gretzky falling all over the place like a grade-schooler. Now that we are all a bit older and wiser than our baby selves, looking stupid isn’t fun. But being willing to risk the emotional pain of making mistakes is one of the most important things we can do to grow. Somewhere along the line, many of us were taught that making mistakes is the worst thing we can do…and that’s simply not true. Reaching, falling, and reaching again is the only way toward mastery of a skill. We cannot be afraid to look silly in the process. What if you decided to think of mistakes as guideposts you use to get better, instead of…well…mistakes? Hmmm. As my trusted readers know, I always bring it back to music: In my training as a musician, I have spent a ton of time in places and schools that encouraged “productive mistakes”. I was surrounded by rules that encouraged me to reach beyond my comfort zone (normally a place that feels risky and bad); all the while I was being nudged into a “new” comfort zone beyond my current ability. What a great way to learn and get better! What does “looking stupid” look like in other areas of life? How about the person who drives a crappy looking car with no car payment to pay off debt or accumulate wealth? Or the dancer who looks awkward in front of everyone while learning a new move? Or you…making a decision at work that scares you to advance a passionate idea of yours? Whatever the case, the goal is the same: reach beyond what you are now capable of, and use mistakes as goal posts to navigate to the correct behavior. Good luck!